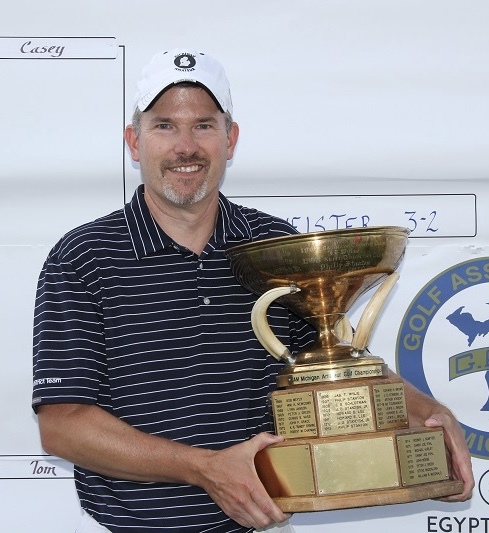 Last Saturday, Kentwood’s Tom Werkmeister, 49, won his second Michigan Amateur title at Egypt Valley CC in Ada in a 3 & 1 victory over Beau Breault. One of state’s best players and a consummate gentleman, he is a Michigan Golf Hall of Fame member. In 2013, Werkmeister was the first amateur to win the Michigan Open Championship in 38 years. A holder of numerous west Michigan and state titles, he’s been the Golf Association of Michigan’s Player of Year on several occasions and has qualified for a host of national championships. Last September, he was co-medalist and led his team to victory in the 12th USGA State Team Championship, a first for any Michigan squad. A Detroit native who grew up in Warren and honed his game near the family cottage in Gladwin, Werkmeister was a two-time all-state golfer at Warren Mott High School and a junior college All-American at Macomb Community College. Recently, he spoke to me about his recent Amateur win and his upcoming plans to turn professional later this year. How did it feel playing at Egypt Valley in the final match in front of family and friends? Well, I wanted to make sure I didn’t do anything stupid, like hit myself in the face! But seriously, it was cool to be playing in front of family and friends, including some people I hadn’t seen in a few years. It made the experience that much better. How do you compare it to your first Amateur title in 2009? Definitely, it was cooler weather. To compare the two is difficult. The first one was really special because it was my first Amateur title. But this one is special in its own way because it was in my home town in front of a bunch of friends. It’s hard to put it into words. How did you feel coming into the tournament? I felt confident going into the Amateur. I had a good finish in the Michigan Open [he was low amateur and finished runner-up] the week before so I was playing well. And I knew Egypt Valley; I’ve played it probably 20-30 times in the past. Plus there’s the advantage of being at home where we had a couple friends from Detroit staying with us. The whole week couldn’t have been better. How tough is it to win the Amateur? Talk about the hurdles. What were thoughts on the 16th tee when you were only 1-up after Breault had won the previous three holes? For the first time all day, I became a little tense. I wasn’t nervous during the match and felt quite comfortable. Although Beau had the momentum I still had the lead. I knew I had to stick to my game plan and play it out. But when he hit his iron shot over the green, it gave me a boost of confidence. When he made bogey, I was back to 2-up with only two holes left. Thinking back on his tee shot, he may have underestimated the effects of both his own adrenaline and the prevailing wind behind him. I know experience has taught me in that situation—when you’re fueled by emotion— to dial back a little bit. Beau’s a talented player and he’ll learn from it. What were other key matches during the week? I definitely had some comfortable matches where I was up all day but I must say my quarterfinal match against Ken Hudson was particularly tough. We both played well. He had me one down at the turn and then I won a couple of holes on the back nine to get ahead. Then I hit my best shot of the tournament on 17: a hybrid second shot from 240 yards to eight feet of the flagstick which clinched the match. Give us a glimpse inside your golf bag for the Amateur, especially your putter. I’ve played Callaway for the last five years. My putter is a vintage Jack Nicklaus Muirfield blade—resembling his famed George Low model— that I’ve used for 31 years. In fact, I’ve been struggling with it and was thinking about trying something different. Maybe the new models could be beneficial to me. I get too wristy with my putting stroke so there may be a new style that might help me. My driver is a three-year-old XR-2 model that I’ve been hitting well so there’s no need to change. I also have a three wood, 18 and 23 degree hybrids, five-nine irons and four wedges. My wedges are pitching wedge, 52, 58 and 64 degree loft. The 64 degree is my get-out-of-jail club and one’s been in my bag for 15 years. I can’t believe more people don’t use them. I just changed the grip on it because it was the most worn of any of my clubs. Depending upon the shot and the lie, I use it from 70 yards in and from any tight up and down situation. Talk about Mike Boogaard as your caddie, coach and friend. He was a big part of my win. The only round he missed was the second day of stroke play. He’s always been my putting coach but he’s more than that. He’s a close friend and knows my game really well. He does a great job of keeping my emotions in check. Controlling my emotions on the course in competition is always something I’ve struggle with. Mike’s a huge positive influence for me. He can say the right things at the right time and tries to keep me loose. A good example was after the 15th hole in the finals after Beau had won three straight holes and I was now only 1-up. He quietly said to me, “Hey, come on we can do this; let’s get going.” I knew the situation I was in but he was there to reinforce it. We’re a good team. (l to right) Anthony Sorentino, Werkmeister, Evan Bowser, and Ken Hartmann at the USGA State Team Championship. Talk about that great win for you and your teammates at the USGA State Team Championship last year. And you were co-medalist, too. It was such a cool experience and so unique in that it was a team event. And I got to share it with two great teammates in Evan Bowser and Anthony Sorentino and our captain Ken Hartmann. It so much fun and rewarding to play for the state of Michigan. It was an incredible experience. 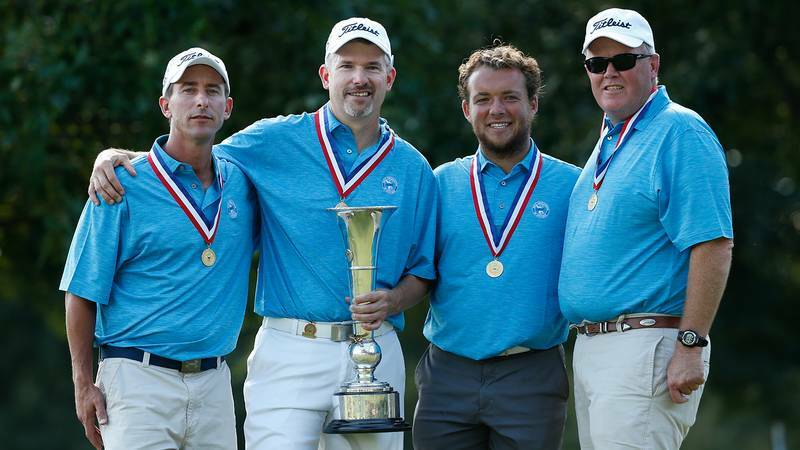 As it turned out, the USGA decided to make it the last Men’s State Team Championship. But we were the last ones and no one can take it away from us. Share your plans to go professional and try to qualify for the PGA Champions Tour. What prompted it? Sometime last year I first seriously considered that possibility. But it was when I won the GAM Championship that cemented my decision to do it. It was one state championship that I hadn’t won. And then last fall I had a really good stretch of golf. By winning the Michigan Amateur again it validates my decision to move forward. In analyzing that decision, how did you weigh its up and down sides? I realize it’s going to be super tough and not a guaranteed success. It will require a lot of work. But I also know I have lots of support and have nothing to lose. But mainly I didn’t want to sit somewhere when I’m sixty and ask myself why I didn’t give it a shot. Now I know I’m giving it a go without any regrets. My plans are to play in a pre-qualifier this fall with the final stage in Arizona in late November. My last amateur event will be the USGA Mid-Amateur if I qualify at Spring Lake CC in August. Are you putting together a sponsorship package to support your Tour aspirations? Yes, we’re currently finalizing that information so we can forward it to people who’ve told me they want to support me. It’s basically a legal document explaining the elements of the sponsorship. I’m very excited about the future.